We hope you all had a wonderful Christmas. We kept to our schedule and baked through the holiday and onto the next cookie recipe in the book, Thomas Keller's version of the Nutter Butter. The consensus from the bakers is that it is a relatively time-consuming cookie to make. If planned in advance though, the efforts are well worth it. The cookie is delicious, particularly the buttercream filling which we all raved about. 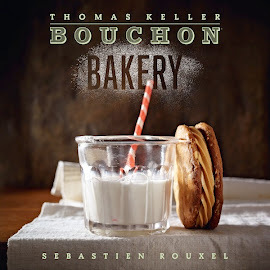 Of course if not in the mood to bake, you know you can always pick up a hefty 4" Better Nutter at Bouchon Bakery. We are continuing with cookies this week. 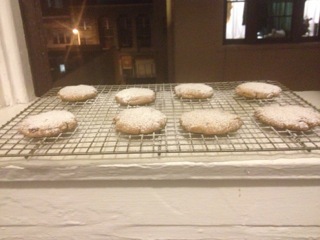 Our group of bakers took on Thomas Keller's Oatmeal Cookies and TLCs. TLC doesn't stand for "Tender Loving Care" as I had thought. 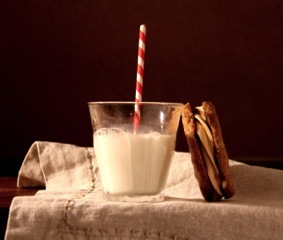 "The Laura Cunningham" is named after Chef Keller's partner and created as a twist on the Oatmeal Cookie. Pecans are used in place of the raisins because Laura does not like dried fruit. After testing, we also wanted to incorporate our own add-ins based on personal taste which you can read more about in the individual comments. Overall our cookies look very similar: thin, flat and golden brown. Several of us had difficulty measuring out small quantities of leavener and spice so hopefully we'll be able to identify a scale that can pick up amounts down to the gram. Also the recommended cookie size is rather large and we prefer to portion the dough smaller. Using the stated 145 grams, Aaron's cookies came out to 7" in diameter. Jenn's were 5". As far as taste, all rave reviews from this group!